If you liked TOKYO VICE–try these books as well. Posted on October 16, 2009 Author jakeadelsteinCategories Tokyo Vice4 Comments on If you liked TOKYO VICE–try these books as well. Reuters’ Isabel Reynolds gets up close and personal with Jake Adelstein about the sotry behind Tokyo Vice. 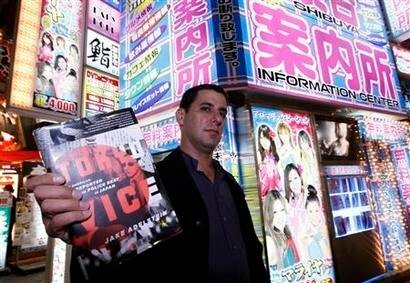 In his English-language memoir, “Tokyo Vice,” which will be published in the United States this week, [Adelstein] tells the story of how he got to grips with the unique Japanese way of journalism, becoming such a serious irritant to the yakuza that he faced death threats and was placed under police protection in 2008. Adelstein, who belonged to a rare breed of foreign journalists writing for the Japanese-language press, spoke to Reuters recently about his career and crime in Japan. JSRC has been in hibernation for most of November, while I’ve been re-evaluating my place in the world after Goto Tadamasa’s fall from power, making a living, and working on the Japanese draft of TOKYO VICE. The book may end up coming out in Japanese before it comes out in English. Many interesting things have happening in Japan’s underworld while we were away and we hope to share them with you by the end of December. By the way, if anyone has questions about the yakuza, crime in Japan, the latest strange trends in the country, or suggestions for something you’d like to see on this site–feel free to write in.